LMU researchers have discovered a novel feedback mechanism that provides a mechanistic link between chronic inflammation and carcinogenesis. Malignant tumors pose a major threat to survival largely because they shed mobile cells that can form secondary tumors in other tissues. This process requires a fundamental change in the character of cells within the primary tumor, insofar as members of a localized cell mass must be converted into actively migrating cells that invade into the surrounding tissue and blood vessels, and finally settle in distant tissues. A growing body of evidence suggests that inflammatory reactions promote such cellular transformation. The protein interleukin 6 (IL-6) is known to a play a significant role in inflammatory signalling. 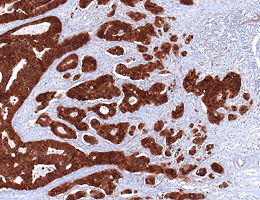 IL-6 is a cytokine, a signal molecule that is produced and secreted both by immune cells and by tumor cells and binds specifically to a receptor (IL-6R) that is found on the surfaces of many cell types. “As we have now shown, even brief exposure to IL-6 can lead to long-lasting alterations in colon cancer cells that enhance their mobility and thus increase their metastasizing potential,” says Heiko Hermeking of LMU’s Institute of Pathology. Hermeking and his colleagues set out to discover the functional basis for this effect of IL-6. Using cell cultures derived from colon carcinomas, they found that IL-6 is part of a feedback loop, which also includes a short RNA, microRNA-34a (miR-34a). It turns out that miR-34a plays a central role in repressing the production of tumor-promoting proteins, and thereby normally serves to inhibit tumorigenesis and metastasis. But as Hermeking explains, “Activation of IL-6R upon binding of IL-6 essentially disables this inhibitory mechanism. It does so by activating the transcription factor STAT3, which in turn inhibits expression of the miR-34a gene by directly binding to it.” As the Hermeking lab could show, expression of the IL-6 receptor is itself directly repressed by miR-34a. Therefore, loss of the microRNA leads to overproduction of the cytokine receptor. Taken together, IL-6R and miRNA-34a form a feedback loop and depending on whether miR-34a or IL-6 is present in excess, tumor-promoting genes are either repressed or activated. Inflammation is associated with increased secretion of IL-6. The newly characterized signal mechanism that acts between IL-6R and miR-34a via STAT3 therefore provides a functional link that helps explain how chronic inflammation facilitates the formation of metastases. “We have demonstrated the significance of this link in a mouse model system, based on the use of a miR-34a-deficient mouse strain that we had generated. In a collaboration with Professor Florian Greten (Georg-Speyer-Haus, Frankfurt/M.) we found that these mutant mice show an increased tendency to develop inflammation-induced tumors”, says Hermeking. Notably, these miR-34a-deficient tumors invaded into neighbouring tissue, which was not observed in normal mice. Using cultured cells derived from human tumors of the breast and prostate gland, they confirmed that the IL6R/STAT3/miR-34a feedback loop is also activated in other tumor types. “Furthermore, analysis of tumor samples from large cohorts of colorectal cancer patients revealed that activation of the loop is associated with metastasis”, Hermeking reports. The new results show that miR-34a inactivation contributes to metastasis by activating the oncogenic IL-6R/STAT3 pathway. The discovery of this feedback mechanism also offers a number of targets for therapeutic intervention. In addition to STAT3 and IL-6, which are already targeted by a number of anti-tumor agents, the new study directs attention to the potential of miR-34a as a further focus of drug development for the treatment of metastasizing colon tumors. “We have previously shown that the miR-34a gene is often epigenetically inactivated by CpG methylation in tumors, which are more likely to metastasize. Detection of miR-34a inactivation may therefore represent a useful prognostic marker”, says Hermeking. The work described here was supported by grants from the German Cancer Aid Society (Deutsche Krebshilfe) and the German Consortium for Translational Cancer Research (DKTK).